I think the nurse is perfectly placed on this page. The mechanic, miner, & oil worker use heavy machinery and tools & might get injured & need her help! 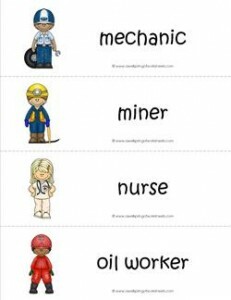 Please go to this page to see all the community helpers vocabulary cards in this set.